I finished my second quilt. Woo hoo. And, it looks exactly like the first one I made... just with different colors. Hey, once you find a good thing, go with it, right? Actually, I really loved the first quilt I made but it was a gift for my sister, so when it was time to make one for me, I decided to make the same thing... a little larger. I started this project here. Yes, July 5, 2011. One year and 6 months ago. I didn't say I was fast. This quilt is 5' x 5'. I made it almost the same way I made the first quilt. (the tutorial is here) This time I added a cream boarder on all sides before the binding. I googled, like always, to figure out how to do that. 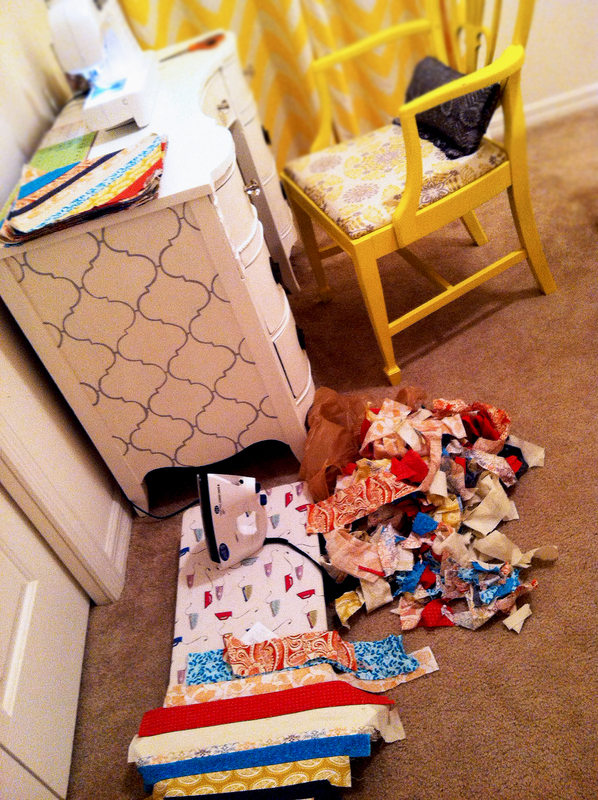 If you're wondering what the quilting process looks like at my house... here ya go. (Yes, I iron on a tiny ironing board crouched on the floor). Since I didn't have a good picture of trimming the squares in the last quilt, I took one durning this quilt. This is the back of one of the squares. (you can see the green leaf scrapbook paper under the ruler). Just line your ruler up with the edge of the paper, and cut. Once you do all 4 sides, you have a perfect square. All of my finished squares lined up on the guest room bed. The paper is still on them in this photo. I used old scrapbook paper as the templates for each square. Which, didn't end up being the smartest idea in the world. You see, scrapbook paper is quite thick. To try and rip it from my sewed strips was almost impossible. After almost ruining 2 of them, I came up with the genius idea to soak my squares in the sink (for maybe 5 seconds). Worked WAY better! Soaking-wet paper rips quite easily you know. :) After the soaking and ripping (and explaining to my husband wtf I was doing) I strewn the squares on every flat surface I could find in the kitchen and laundry room to dry. In hind sight, a spray bottle might have been the better option... but this way was kind of fun none the less. Here's one all ripped off. The little white bits of paper still left don't matter. 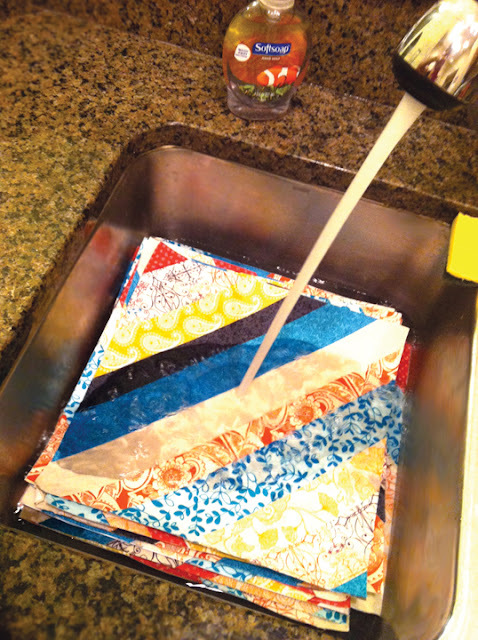 After everything dries, layout your squares again in an order you like and start sewing them together. Bottom two rows are sewn in this picture. After sticking your quilt sandwich together (back, batting, top), start quilting. 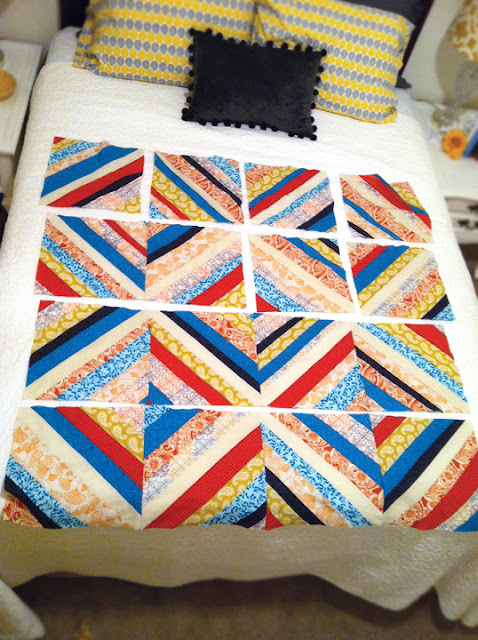 I did free-motion again this time and it was a bit harder with a bigger quilt. That's a lot of material to shove around! 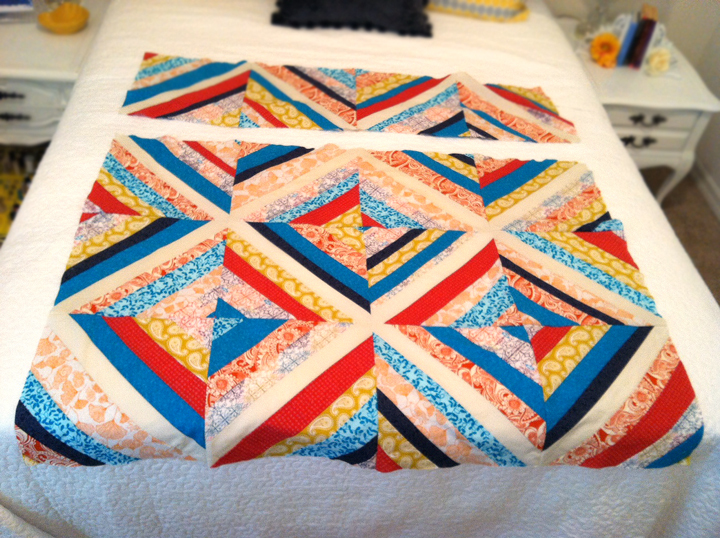 Also, I got the tutorial for the binding from Red Pepper Quilts if you're wondering. So it's done! I have no idea what I am going to use it for yet... I just like looking at it. :) I originally thought I would bring it to the beach to sit on but after the amount of work I put into this sucker, I don't want it getting grungy. Here's the back. I made this pattern 100% from necessity. I was running out of fabric and this is what I came up with to cover the whole 5' x 5' square. haha Seriously, that is what happened. 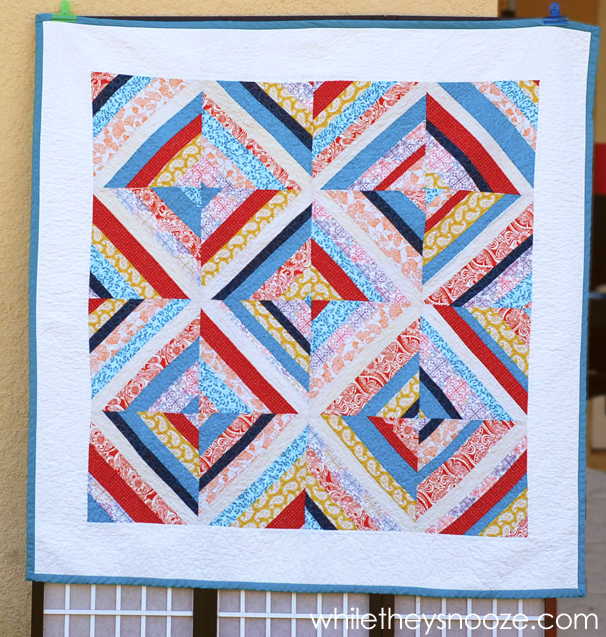 UPDATE: Click here for the video tutorial I made for free motion quilting. That is gorgeous! Loved "watching" your process. New follower. Thanks :) When I was putting the squares in the sink I couldn't decide if this was a great idea or a horrible one. Worked out though! Thanks Jackie. I'm steering clear of the poop potential for now... but you never know. Hey! Thank you for a very clear tutorial. What is was wondering how the free style stitching goes? You just kinda make circles? Or is there like a pattern that you follow somehow? It turned out really pretty. I like your fabric choices. You quilt looks great. I am still trying to get my nerve up to sew a quilt. I have a T-shirt quilt to make first and then I will get to do something cute. I love yours! Yeah, I really like my machine too :) Thanks! 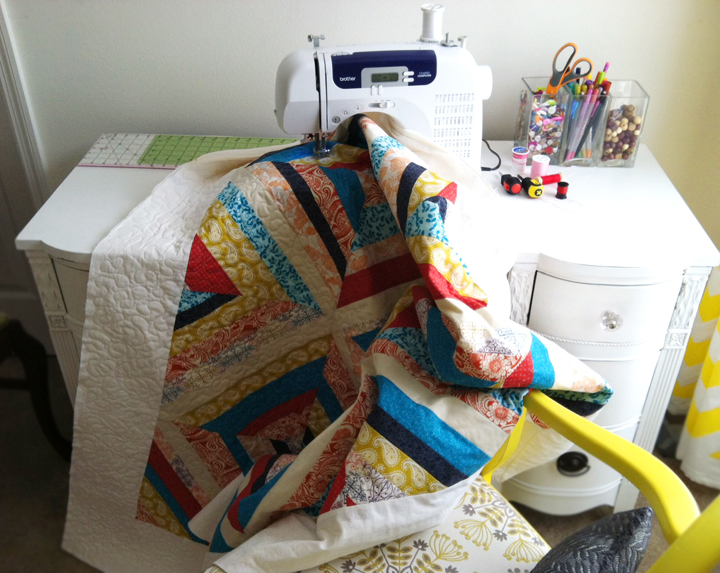 I love quilts, they just take me forever to make! what 'wtf' stands for!! I would have never guessed! It's gorgeous. Too gorgeous to use for the beach. Would look fabulous as a wall hanging. Original art! Awww, thanks! Yeah, several days into sewing the strips I pretty much knew I was never going to throw this in the sand. haha Right now it's in a drawer in my guest room. I really should get it out and find a "home" for it. :) Thanks!!!! 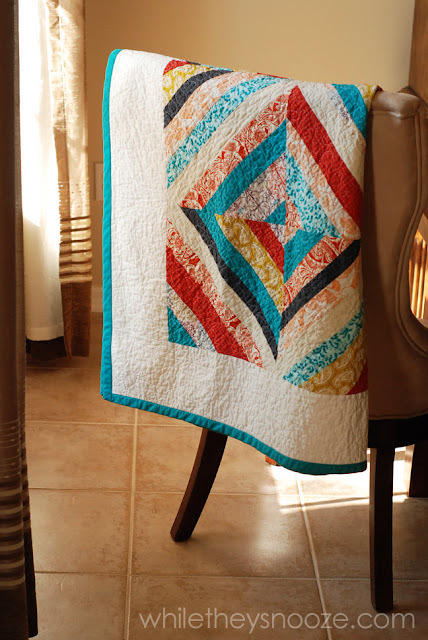 Love the tutorial and quilts, but I gotta say that your photography is AWESOME!!!! I just loved it! Wow that's beautiful! Awesome job! I was wondering what type of sewing machine you had ? Hi Brenna. Thanks so much! I have a Brother CS 6000i. Here's the link. I bought it from Walmart.com and I think I got free shipping. Good deal! It's worked well for almost 4 years now. Thanks!!!! Hi Roseann! Well it took me forever to catch up on comments but I finally made it here! :) I think that's a fantastic idea. I've always wanted to make something out of the baby outfits I can't part with and I also have my wedding dress collecting dust in a closet. If you don't have an attachment to it, what do you have to lose? I say go for it! You might have to back the dress with something stable if it's thin or slippery. But it should work. Omgoodness You make it look tooo simple!!!!!! I cant wait to try!!! Am very new to sewing just got my first machine at age 45, in response to not being able to find any curtains I liked and I (thought sheesh how hard can it be to sew your own..lol) They turned out pretty well.. sorry I digressed, my question is what kind of material do you use for your quilts? Hi Tara! It's really not hard... just repetitive. :) So find yourself a good TV show and go at it. I have mainly used quarters for my quilts. They are pre cut squares in the quilting section of Walmart or JoAnn's (or any fabric store). Usually $1 - $3 each. 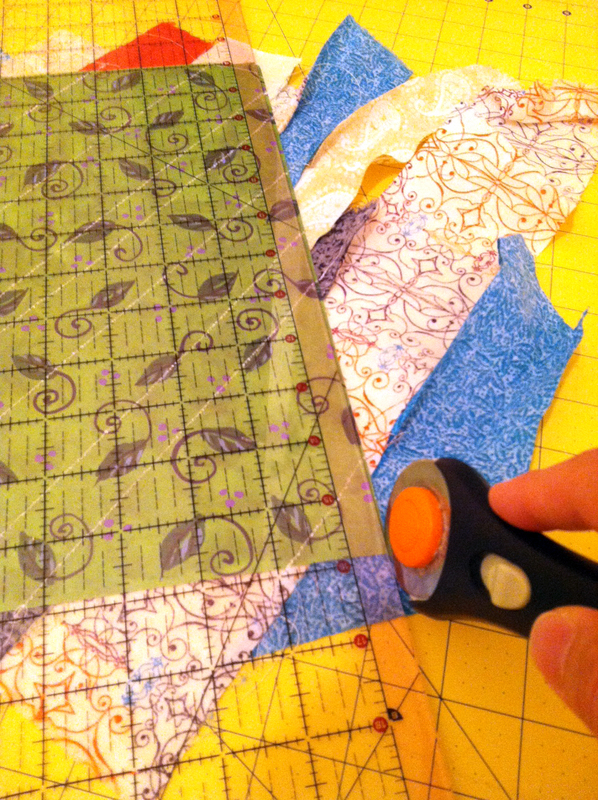 If I can't find a quarter I like, I get fabric cut from the bolts but I always stay in the quilting section. So I think that means always cotton (maybe ploy/cotton blend)? Think like cheap sheets material. Does that help? You are so VERY clever. I like this one just as much (if not more) than the first one you did! I've sewn for years, but never attempted a quilt. As I said, you've convinced me! Hi! I just stumbled upon your blog and was hooked immediately. 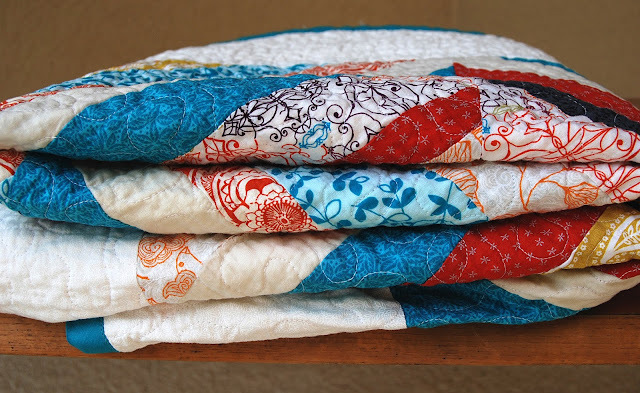 I just loved your quilts.. they really are very beautiful. I am from India and some of the items mentioned in your tutorial like fusiboo etc are not available here... so I guess I would be doing basting stitch with hand to hold all the layers together!! but could you suggest what to use as the central layer in the absence of fusiboo? 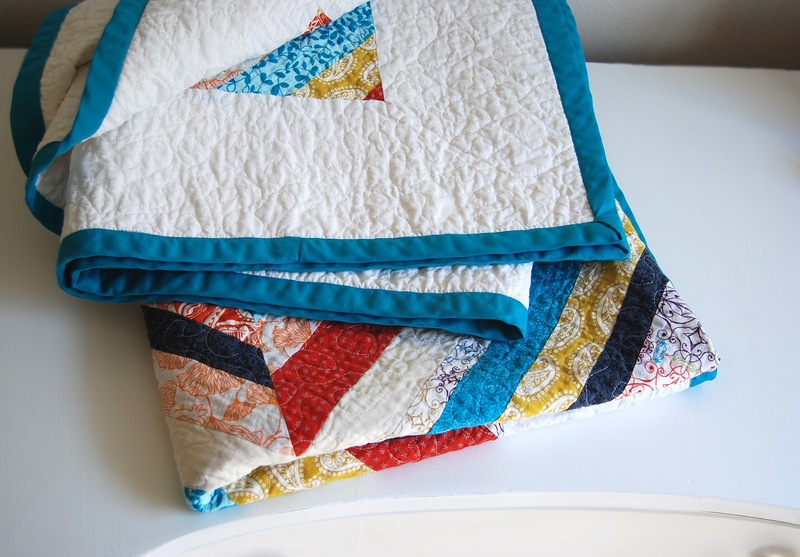 Although the very thought of taking up such a project terrifies me, but I have fallen irrevocably in love with your quilts and now I really want to make them (hope they turn out as good as yours). Thanks! You're so sweet. :) Quilting isn't that hard. Just tedious and time consuming. But, I find repetitive things relaxing and do a little bit at a time. For the middle of the quilt you could use any sort of flat batting (a flat cottony fluffy sheet). Not the batting they stuff pillows with, but the kind they sell in flat rolls. If you can't find that, you could always use an old blanket! The point of the stuff you put in the middle is to give the quilt some substance and warmth I think. So, you could really just stick an old blanket in there and achieve the same thing if you're having trouble finding batting. Hope that helps! 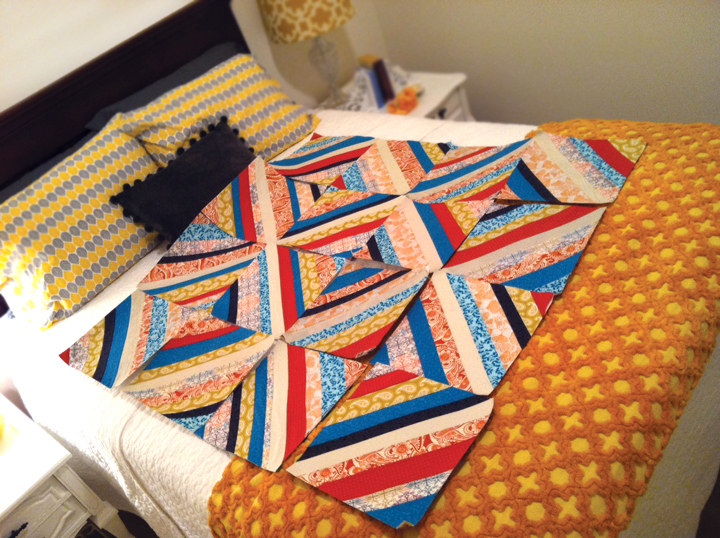 Both of your quilts are absolutely gorgeous...I am jealous!! I have had tons of fabric for years and just scared of messing it all up, but your tutorials have been extremely helpful and I'm ready to give it a try! 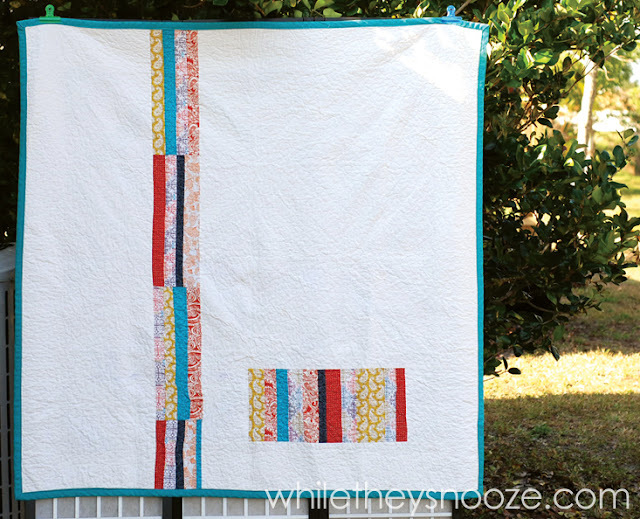 I am wondering though what steps you went through to add the white border to the front of your quilt. Are they squares like the colored fabric or something else? Thank you!! You are the reason I started quilting! I did your first one and have been hooked since. In the last month I have done 5 quilts! Thank you for your awesome tutorials and help! Hi Krystal. Really?!? That's so great to hear. Honestly, most of the time I publish blog posts I assume the only people who read them are my friends I have forced to "follow" me and some family members who probably just skim the pictures. lol So it always takes me back when someone says I helped them learn something or inspired them to do something. Really cool! I'd "favorite" your comment if that was an option. haha You made my day. Thanks!!! I am so inspired! I love your simple, no-nonsense take on making a quilt-it's like sitting next to someone and being shown first-hand how you started out on this journey of making your first beautiful quilts! Thank you. I am living in Ecuador where the price of bedding is outrageous. I just bought a sewing machine last night and hope to start back at it. 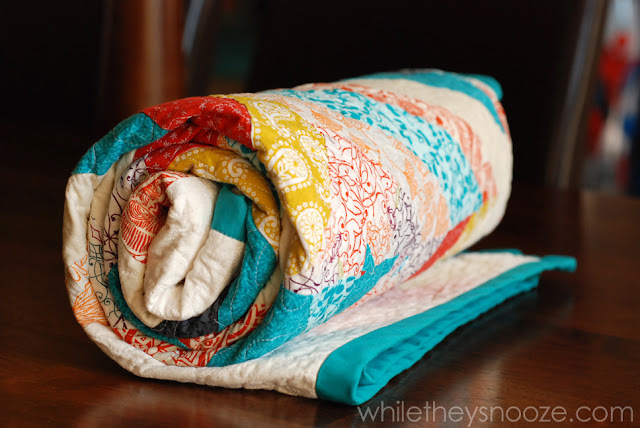 I have never done a quilt and hope to start one for a queen size bed (coverlet). This might sound crazy, how do you cut all the strips? Can't find a rotary cutter down here yet. And I noticed, that your strips were not all the same width, that doesn't matter? And lastly, can I just take the foot off my very simple machine and quilt it that way? Wish me luck in finding all the supplies needed. I live in a very small fishing village! but can't wait to start. THIS IS THE BEST TUTORIAL YET! I love to sew, but I am no professional. My little bit of knowledge comes from my mom working in a sewing factory when I was little. I am having my first grand baby a BOY and the Mom wants a vintage nautical themed quilt. Huh, I have sewed a lot of things but never a quilt. Thank you for making me feel I can do this. I love, love both quilts I've seen so far and as you said I feel I might get a bug for it once I get started. Thanks again. Now to find the themed material. Aww, thanks Penny! You made my day :) And yes, you can do it and no, it doesn't need to be perfect. I'm sure you'll do great! Share it with me when you're done. I wanna see. 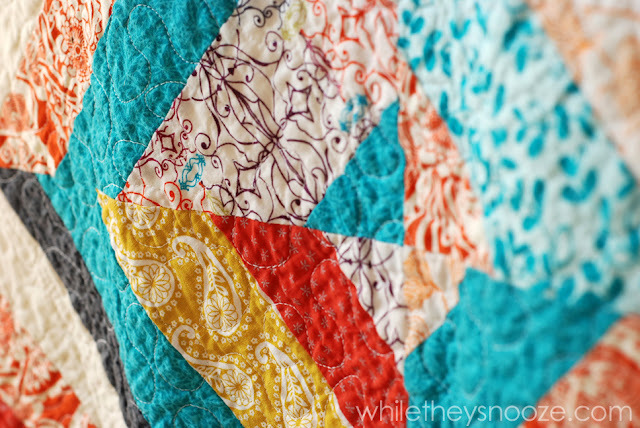 Really pretty and happy quilt. Here's a suggestion: Use pages from discarded phone books as your block foundations. Recycling at its finest! I make lots of these String Blocks -- also teach Beginning Quilting and am amazed that a new beginner would post a tutorial. 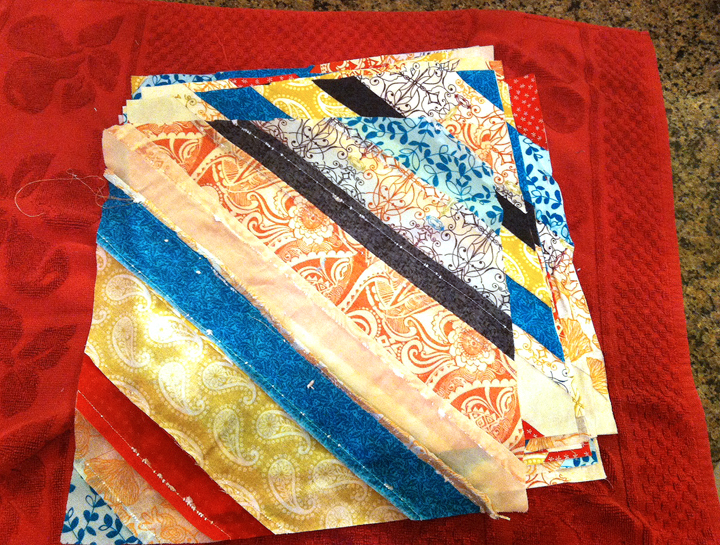 I'm succeeding at using up mountains of leftover scraps of fabric as I make more and more blocks. The only problem is that fellow quilters keep bringing their bags of scraps to me, and I can't turn them down. Three kid-size quilts down so far and a fourth, larger one pieced together but not yet sandwiched and quilted. 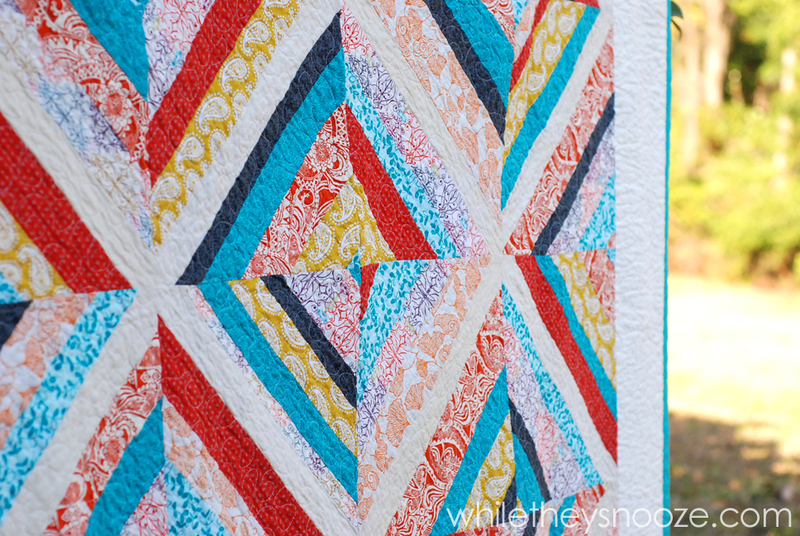 Another thought: Wait until you've completed the quilting step to trim your batting and backing even with the quilt top. 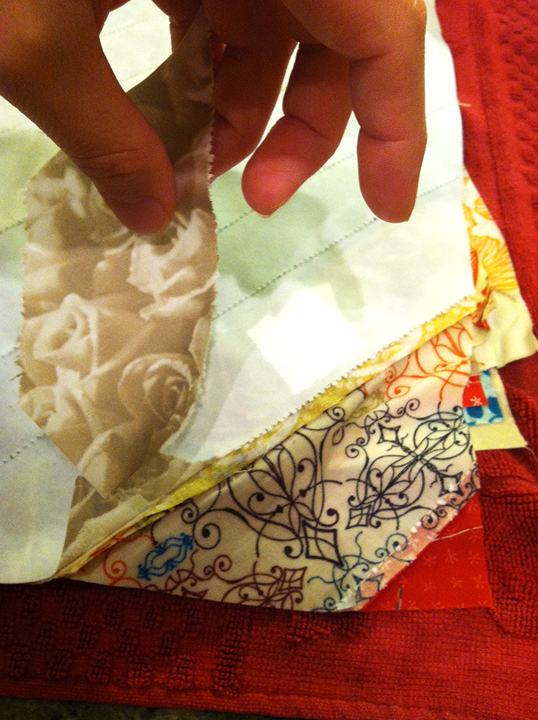 The quilting process can shift the layers around and you could end up with the backing drawn up more than the top. I'm sure you've learned a great deal since these first quilts, but you certainly got off to a good start.